As the release date of the upcoming Civilization VI game draws closer, developer Firaxis has kept on releasing preview videos showcasing the different civilizations players will be able to take control of in the game. We’ve already seen the likes of England and Brazil will feature in the game, and also ancient civs like Rome, Cleopatra’s Egypt and newcomer Scythia will also be available in Civilization VI. Never mind though, as judging by Firaxis latest preview video it is clear that Sumeria will be a strong civilization for those looking to win the game by force early on. 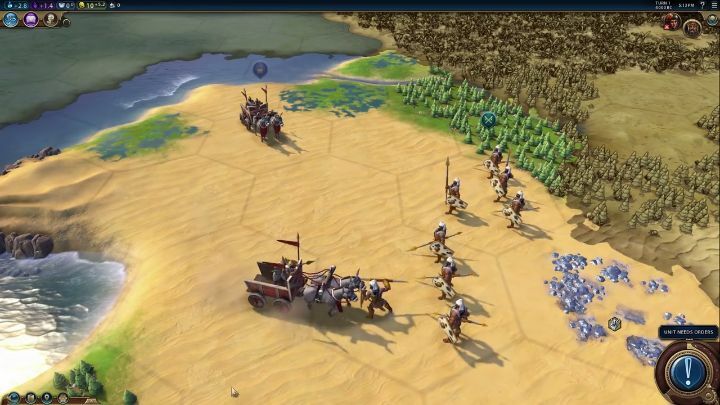 This is because not only does the Sumerian civ receive bonuses after defeating barbarian encampments, but they can also field their powerful war-cart units early in the game. These are highly mobile and can even take on spearmen or other anti-cavalry units head on without suffering any penalties in combat. Sumeria will also be an interesting civilization to ally with in the game when one is heading to war, because when Sumerian units defeat an enemy unit combat experience will be shared with allied units within five map tiles (even if they did not take part in the fight). It is clear then, that Sumeria will be a military power to reckon with in the early game, and players who start the game close to the Sumerians will need to be wary of their war-carts and other military advantages, while those playing as Sumeria will want to try to gain an early military advantage. It looks, then, that Sumeria will be another interesting civ to take control of in the upcoming Civilization VI, a game that’s looking like it could be one of the better entries in the iconic strategy series when it hits the shelves this fall.